The days are getting shorter, and the nights are getting colder—time for more soup! 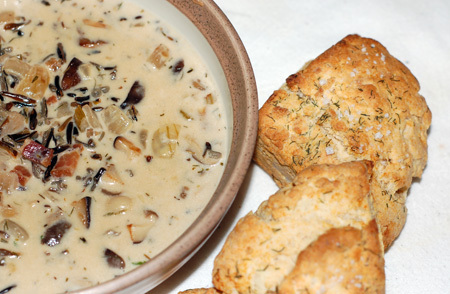 For some reason, creamy mushroom and wild rice soup was sounding really good to me, so I got some oyster and shiitake mushrooms at the farmer’s market on Saturday; the wild rice is also from the farmer’s market, although I purchased it earlier in the season. The finished soup, while tasty, was not the real stand-out in this meal, however; as seems to happen so often in our house for some reason, the side turned out to have the more interesting story. When I started pulling out ingredients to make scones to accompany the soup, I realized with horror that there were only 2 tablespoons of butter left in the house. An emergency trip to the grocery store was not in the offing, and I really had my heart set on the scones, which are typically loaded with butter, because I wanted to make half the batch savory—full of chopped squash blossoms, even—to go with the soup, and the other half sweet to save for the next morning’s breakfast. For me, savory muffins just don’t have the same ring, but I thought maybe I could work something out with with Mollie Katzen’s fraternal chocolate-ricotta and scallion-ricotta muffin recipes. A little research and I realized that it was possible to make scones using ricotta—in place of the butter! This I had to try, especially since I had just about the right amount of homemade ricotta leftover from the previous night’s stuffed squash blossoms. I was so absorbed in this novel idea that I completely forgot to add the squash blossoms and feta I had intended to use in half the scones. Instead, my savory scones were simply seasoned with dill and topped with fleur de sel; the other half got a handful of chocolate chips kneaded in and a sprinkle of sugar on top. My scones had such a similar texture to the standard butter-filled ones that I really couldn’t even detect a difference. Since I used some pretty well-drained homemade ricotta, I have to wonder, however, if the wetter store-bought ricotta would yield a different result. I should also note that I didn’t really care for the dill scones, which just tasted really odd to me. Jeremy liked them, and I tried really hard to put my finger on what was bothering me about them, but I couldn’t put it in words—as near as I could guess, the honey and dill interaction wasn’t working for me. 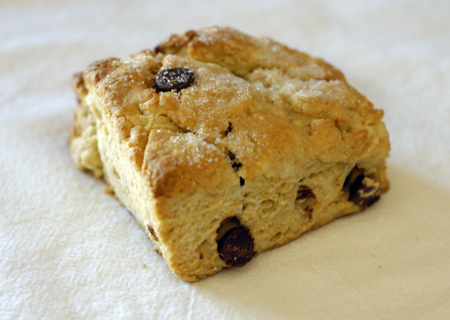 The chocolate chip scones did not suffer from the same issue, I am happy to say! Preheat oven to 425F. Sift together flour, baking powder, baking soda and salt in a medium bowl. In another bowl, lightly whisk the olive oil, honey, egg, and cream or milk. Use a pastry cutter or fork to blend the ricotta cheese with the flour mixture until the mixture makes pea-size crumbs. Make a well in the flour mixture and add the olive oil mixture. Stir with a wooden spoon until a dough ball forms. Remove the dough ball to a lightly floured surface and knead lightly, just enough to form a workable ball. Work in any desired flavorings, sweet or savory: herbs or cheeses on the savory side, for instance, or nuts, spices, dried fruit, zest, or chocolate chips on the sweet side. Pat the dough into a flattened disk about 1″ thick. Using a sharp knife, cut into 8-10 wedges or squares. Place dough pieces on a baking sheet covered with parchment paper or a Silpat, about 2 inches apart. Brush tops with more cream or milk and sprinkle with either finishing salt or a hard cheese like Parmesan if you are making savory scones, or sugar if you are making sweet ones. Bake for 12-15 minutes, until golden brown. Source: Slightly adapted from Lemony Zest. Cook bacon in a large stockpot over medium heat until the fat renders out; remove to a paper towel, reserving the fat in the pot. Add the onions, celery and carrots, and saute until tender. Add garlic and mushrooms; saute until the mushrooms release their liquids and start to brown up in spots, several minutes. Dump in flour and cook, stirring constantly for another minute or two, to cook the raw flavor out of the flour. Add the wine and cook until it reduces away, 1-2 minutes; then pour in stock, stirring to prevent lumps from forming. Add thyme, salt and pepper, and bring to a boil. Lower to a simmer, and let cook until mushrooms have softened, soup has thickened slightly, and flavors have melded, about 20 minutes. Add wild rice, reserved bacon and cream, allow to heat through, then taste and adjust seasoning if necessary. yum, great cold weather comfort food! Those scones sound fantastic, I think your idea of using ricotta was inspired.